If you're getting the new PlayStation Vita from Sony, you'll want to get some sort of memory card to optimize your experience. 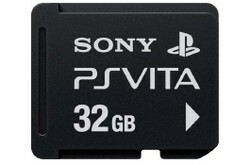 If you're thinking about getting a PlayStation Vita, a PS Vita memory card is an important purchase to consider. After all, certain games absolutely require a card in order to play, according to this article on EuroGamer. And not having a card is going to put a serious damper in the handheld's capabilities. (Unless you're getting a PlayStation Vita First Edition Bundle , which includes a 4GB card, in which case getting a separate card is less important, especially until you have time to figure out your personal memory card needs). If you're like me, then you're a little upset that Sony has decided to use an expensive, proprietary card instead of a standard SD card, which can be purchased for not a lot of money. Even after reading Sony's explanation (also available on EuroGamer), I'm still not feeling much better about the whole situation. Still, since you're going to need to buy in if you want to use the Vita, you might as well learn some details about the Vita SD cards and usage. Why do I need a PS Vita Memory Card? Some of the games, such as Uncharted and Hot Shots Golf , will require a memory card to run. Also, cards are used for game saves, patches, and additional media you might want to put on your Vita. Why does the PS Vita have dual slots? Some people have been confused about the "dual-slot" capability. One slot is for the SD memory card, and the other slot is for the game media. Which memory card should I get? Unless you're already getting a card with the bundle, I recommend the 8GB PlayStation Vita memory card. Read on to learn more about my thoughts on each of the different cards available. This card comes included with the PS Vita First Edition Bundle. Although you might think it would be nice to get a slightly larger card, the truth is you can get a lot out of a 4 gig card. Especially since most of the gaming action will happen on the actual game media itself. Still, this probably isn't the best choice if you're buying a card separately. At $20, it's the worst value of GB per dollar of all available cards (for example, two 4GB cards would cost $40, but you can get 8GB for just $30). If you can spare a little extra cash, consider upgrading to the next size. This 4GB card is small and mighty. If you're getting a separate memory card for your PS Vita, this is the one that I'd most highly recommend. It's a good value, and should serve most players well for the foreseeable future. Hopefully, by the time you need a larger card, the prices will have gone down, or there will be other options available. This powerhouse card should be adequate for most users. 16GB might be a bit excessive for your Vita storage needs. Additionally, since the GB per dollar isn't much better than the 8GB card, you might want to just get an 8GB card unless you're sure you're going to be storing a lot of data. Then again, it's pretty much guaranteed that the need for storage space will only continue to grow in the future. Getting a 16GB memory card for your PlayStation Vita now is a good way to prepare for the future. 16GB sounds like a lot, but as games start to require more memory, it could be useful to have. This is the granddaddy of all memory cards for the PlayStation Vita. I can't imagine getting this card right off the bat, as even my camera which shoots HD video and regularly stores hundreds of high-resolution pictures gets by just fine on 8GB, and my iPad does well with 16. However, at only $99.99, it's certainly the best value in GB per dollar of the bunch. You'd expect it to be twice the cost of the 16GB, but you're saving $20. This card will be excessive for most users, but if you think you'll want 32GB in the near future, you might as well go ahead and splurge. Which PS Vita Memory Card Would You Choose? Want to Know More About the PlayStation Vita? Should I Get a PS Vita? When you're looking at dropping between $250 and $350 on a gaming system (not to mention the extra you'll spend on games), you'll want to know if the system you're buying is really worth it. This article will help you decide, based on factors such as cost, quality, and potential for fun. Best PS Vita Games: This list scoops out the cream of the Vita gaming crock, and then delivers only those games that are approved by the masses. Best Vita Games (By Genre): If you have a preferred gaming genre, you'll find your fix here. The included genres are also listed below. Thoughts on PS Vita Memory Cards? Thank you so much for this article, it saved me a lot of searching. The Sony PlayStation Vita is a next generation handheld games console. It has a touch screen and lots of sensors and controls for a very interactive gaming experience.